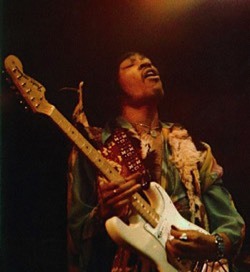 My big idol is Jimi Hendrix. I can still remember very well the first time I heard a song from him. 'The wind cries Mary' is my favourite song and 'Axis bold as love' I used to play to death. I am still amazed about the sounds he magically fired from his Fender. The experimental sound comes back to Peter Gabriel, albeit in a completely different way. The soundtracks 'Passion' and 'Birdy' are very visual. This kind of music goes far beyond a pop song, within which you are bound to a particular structure. Another inspirator for me is Preisner, who composed the music for the movie 'La double vie du Veronique'. And of course David Bowie, Prince, Sting and Deep Forest with their cool sounds and strange samples. Closer to home: Peter Broerse, co-founder of Distance. Together we wrote our first songs. Later I composed together with Taco Groen, which caused unexpected twists. The acoustic band Tau was formed with Pieter Voogd, Wilberd de Gooyer and us. Don Willard is for the most part responsible for the production of the double-album 'Aloft in a balloon'. As a rookie, I ended up with him in the studio 'Musicfarm Holland'. He taught me a lot about recording, recording and making. He also wrote almost all texts. Finally, I want to nominate Leander Buiting, a guitarist from Zutphen, who played beautiful solos, but alas has died.